I cannot believe that we are just a few days away from Christmas! Who am I kidding, I’ve been blaring Christmas music since the end of October. We also got our tree the day after Thanksgiving. I usually wait till as long as I can go to really dive into Christmas, but this year I was sooo ready! The last few days have been filled with last minute shopping, Christmas movie watching and cozy nights in. The two days leading up to Christmas are always spent with family so I’m relishing in our cozy little home while I can. As I’ve gotten older I’ve totally become an online shopper (cough cough homebody) but I wanted to get out there to feel the holiday cheer. I even wore a red sweater and and some jingle bell earrings, okay?! But man, holiday shopping genuinely feels like an Olympic sport! People are cray! The crowds and lines were quite overwhelming and naturally I was getting a little hangry. I’m going to sound like a real millennial but I also always miss Rascal when we got shopping. I wish that I could just bring him everywhere with me! Needless to say, I lasted a good three hours shopping and couldn’t have been more excited to spread out on the living room floor, turn on Elf and get to wrapping presents! On nights like this I crazy cozy, wholesome food made at home. 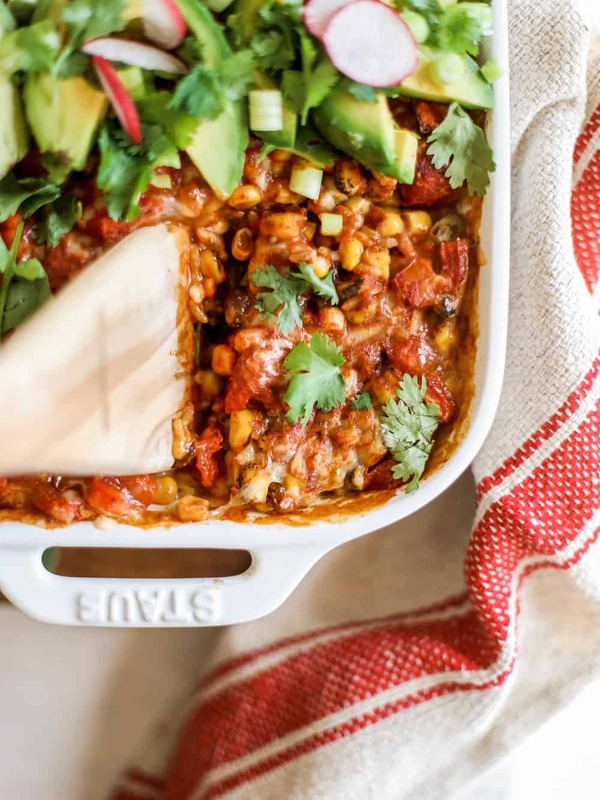 Things like lasagna, chili and enchiladas are my go to cozy dinners. To ‘wrap up’ the night (pun intended!) 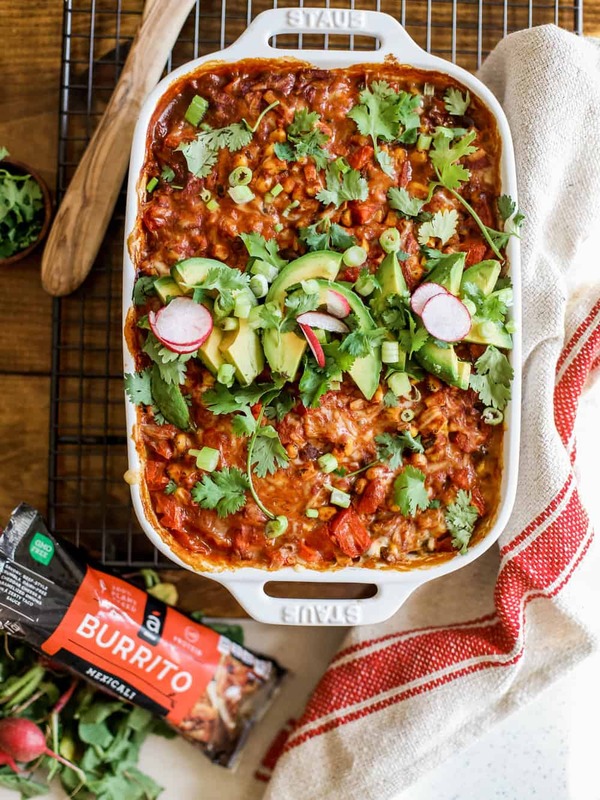 I whipped up a mega each red enchilada Mexican casserole with help from my friends over at Alpha Foods! 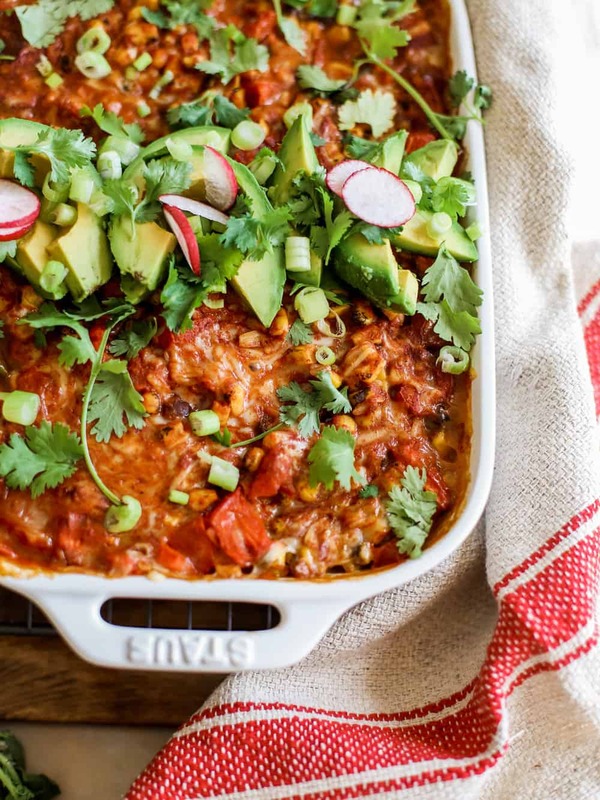 This whole enchilada casserole recipe is entirely plant based! 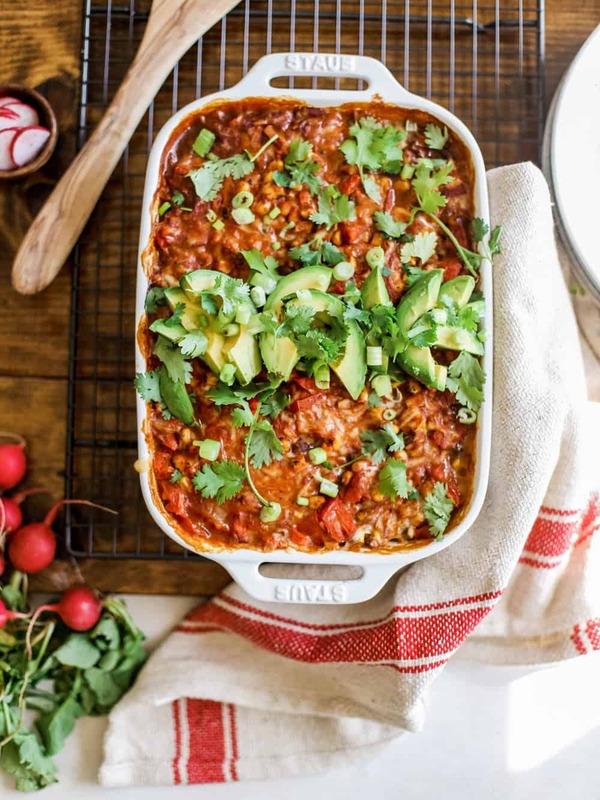 I love an easy Mexican casserole like this because practically everyone can eat it! I whipped up two platters, one for tonight’s cozy gift-wrapping evening and one for tomorrow for a Christmas potluck! To make things easy on myself I usedAlpha Foods Plant Based Mexicali burritos as the main part of the recipe. 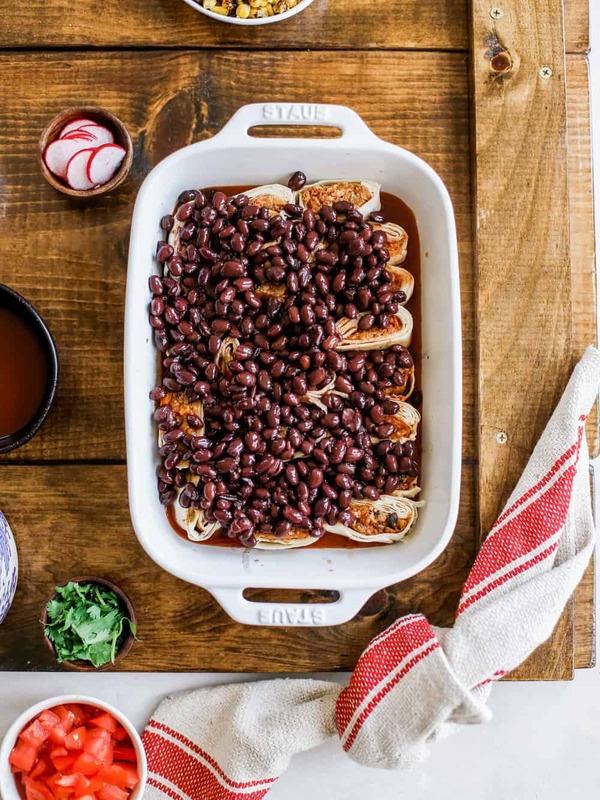 Then I just layered up standard Mexican casserole items like black beans, canned tomatoes and plenty of red enchilada sauce! 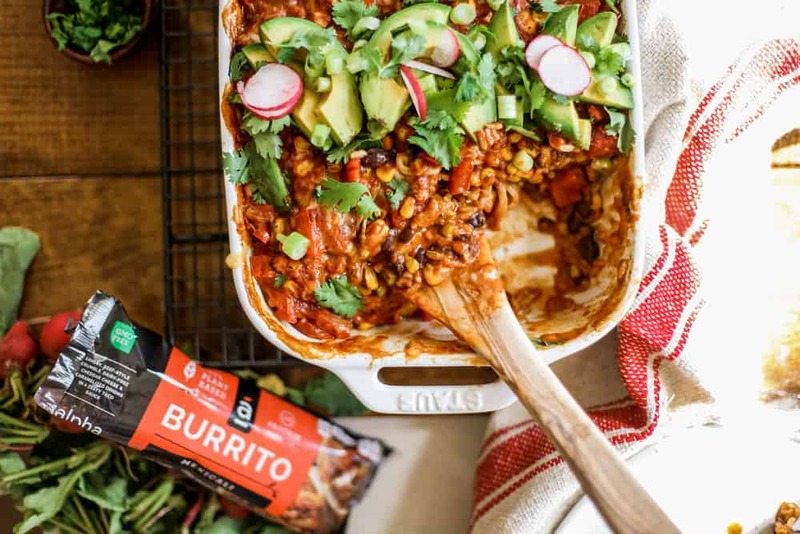 You can stock up on your own Plant Based Burritos with their store locator here! Cook burritos half of the cooking time (about 1 minute) and slice into thin slices. 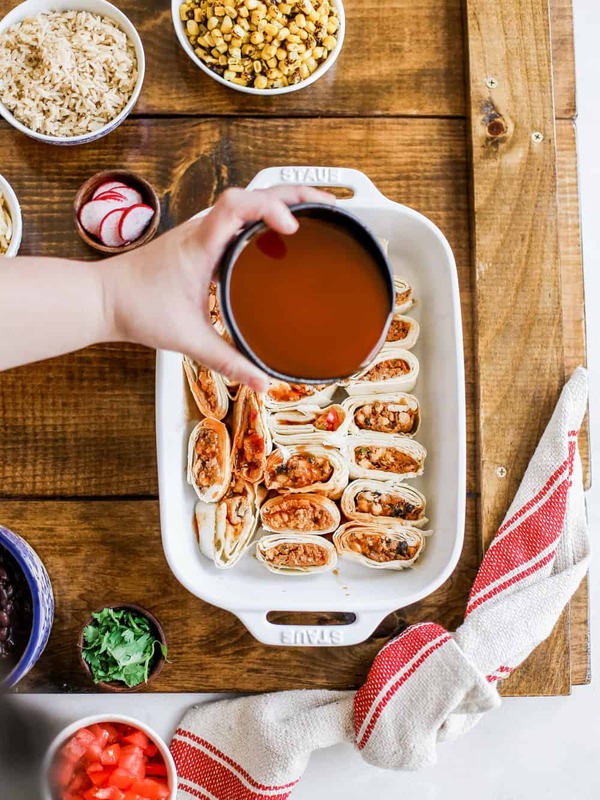 Evenly distribute the burrito slices into the bottom of a casserole dish. Next layer even layers of enchilada sauce, black beans, fire roasted corn, roasted tomatoes, brown rice, and vegan cheese. I was able to get two full layers into my casserole dish with a final cup of cheese on top! 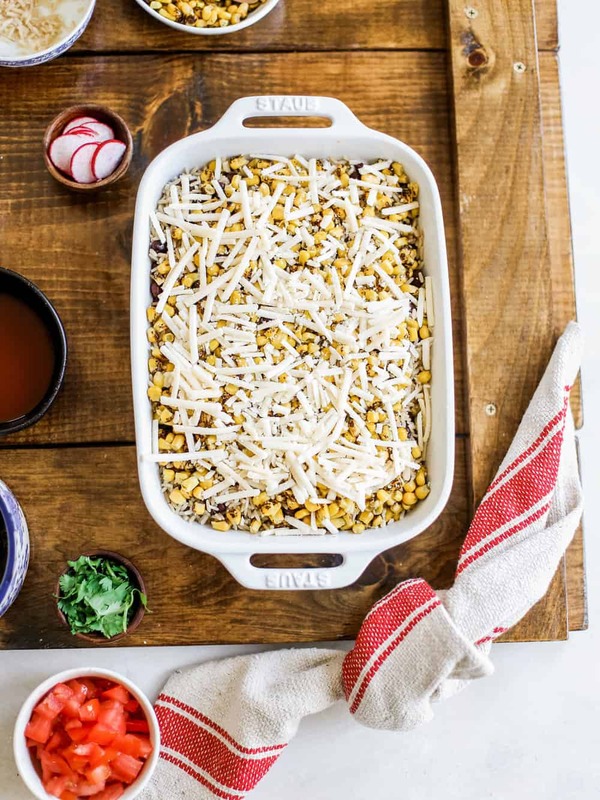 Bake casserole for 20-30 minutes or until cheese is melty and bubbly. 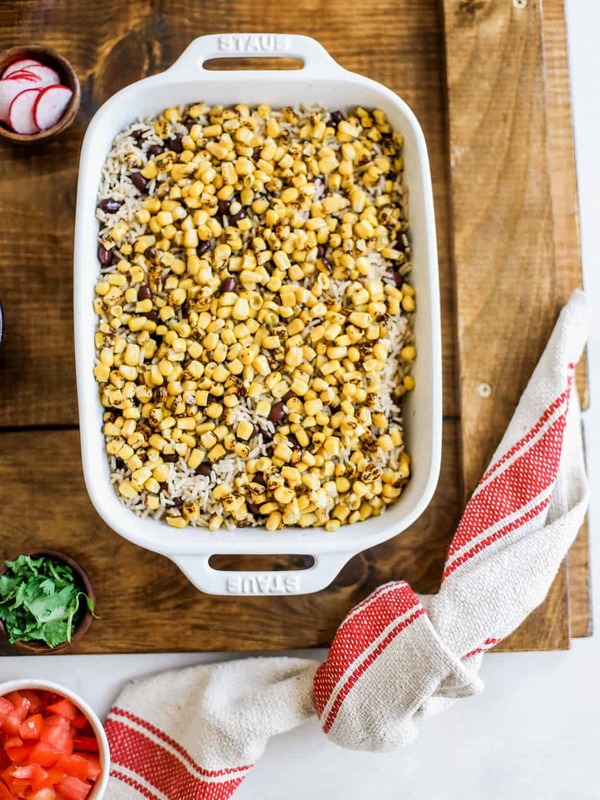 Cool for a few minutes and top the casserole with chopped cilantro, avocado slices, and radish slices.